I don't know why Japanese can't get the “R” “L” sounds down, even after being corrected numerous times they resort back to the wrong accent. One reason could actually be because of Romaji, and the fact that it is taught before actually formal English classes start at primary school. As you can see from the above image “ra” “ri” etc is directly below “ら” “り” etc.. This is Just reinforcing the Japanese “ら　行” accent while associating it to the character “R” so that when ever some one sees a “R” they pronounce it with what we foreigners from English speaking countries hear as “L”. It is a shame that Romaji is taught first at 3rd grade before formal English start's in 5 grade. This is one of the reasons I believe that starting earlier is better, so that children can get the proper accent developed long before that, also their hearing is developed too. 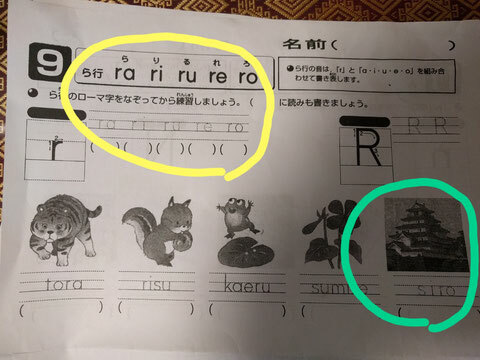 Imagine a 1st grader having no English education all of a sudden wanting to start English, already they are at a disadvantage because the katakana accents is well developed, but not only that only after 2 years of English they start learning Romaji. From what it seems like according to this article they don't want to overburden the children with foreign characters, and that the child should start with communication based English such as speaking and listening, I do agree with this point but as for not learning alphabet but teaching Roman characters in the form of Romaji is backwards..
Look at the above image to where “ SIRO” is, this is another example of causing problems later on .. people learning “SI” instead of “ Shi” are going to be confused when they think their name should be “Shimon” but every body in an English speaking country will be calling them “Simon”. Maybe this is the one reason Romaji is taught, so that the child can Spell their names in Roman characters. Look at the picture of the ship, the romaji word written there is “hune” but to my English ears when Japanese say “ふね” it sounds like an “F” to me not an “H”. I can see where Romaji can be useful for foreigners in their guide books but that's about it and with this newest form of Romaji I can see even more confusion when English speaking foreigners use it. Anyway, I can't change the established system, that knows it's right. So what can I do!? I can say this, get into a foreign language as soon as possible especially while the child is not in the school system(they have more time to do extra curricular Activities), continue with that language ( yes it takes time and money but unless the language is really formulated in the child's brain they will lose their ability to use it really fast. This is why thinking ‘oh they did it for 2 years before kindergarten’,is the wrong thinking). I have seen over the years that children do pick up and comprehend written language at certain ages, 3 - 4 years old they can recognise characters, and short words, by 5 years they notice longer words and start reading (with understanding , not forced learning) by 6-7 they are reading fairly well with help and can sound out words by themselves . 8-9 they can read most things. So what the ministry of education says is true to a point, the children should know the foreign sounds before they learn the alphabet, but based on my observations that means starting well before the age of three. If it takes 8 -9 years to get good at English and that is in an English only environment and more than once a week for 50min ( which most schools offer) imagine them starting at 3rd grade. Which is what they are intending on doing in Japan from 2020. English path article this author seems to think that kind of thinking is ok. He says even without being able to hear the “R” and “L” sounds the examinee will still be able to get a pass mark on their listening portion. One thing he does mention is some people think that getting the mother tongue established is more important than learning another language, but he points out that in Korea; who have been doing English in school from 3rd grade; haven’t noticed any notable problems in Korea's Native language. But in reference to the aforementioned point, I disagree about just learning English to pass an entrance exam, that's not the point of learning the language. This article in the link below high lights that now countries are starting to demand proficiency in English before a Visa is accepted. In the past you were able to gain proficiency in the country for 2 years before you were assessed it is something to think about. I'm right now in an interesting predicament, in Little Lorikeets we have older students who started when we first opened and are very good at English but started learning English at nenchu , nencho level and though they understand most things, when they encounter a real conversation between myself and another teacher they have to listen very hard to keep up, whereas the children that were babies when they started and are now at nensho level can understand what we are saying at speed. Which is great because it's proving my point and as companies such as Honda, Rakuten, P&G have made it or are making English the official language of the workplace for communications, meeting etc and it is essential to know. So the more chance you give your child when they are young to become bilingual the better opportunities they will have when they are adults.